The Edward VII Sovereign is a British coin that dates back to the very beginning of the 20th century and was widespread legal tender through to the end of the First World War, despite the monarch’s death in 1910. One of the more gregarious monarch’s, many of the early coins were collected in his honour, although the outbreak of war meant that few could afford to horde coins. It is for this reason that the coins are often well worn and their conditions can vary wildly. 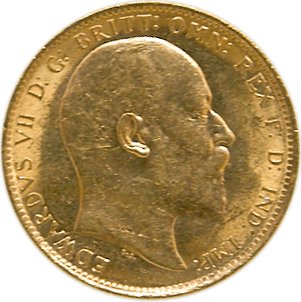 Edward VII ascended to the throne in 1901, but the sovereign’s minted in his name were not released until the following year, when he was officially crowned. The majority of sovereign’s in this era were actually minted in Australia, around ¾ of the total release, likely due to the huge gold reserves discovered in Australia throughout the previous century. 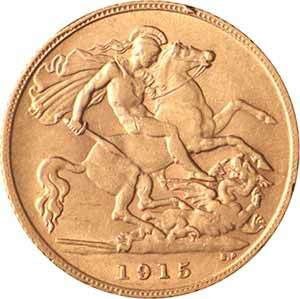 Gold sovereigns themselves are one of the oldest coins still in circulation, beginning in the 15th century under the reign of Henry VII. This has in part given the sovereign its iconic status and makes them highly collectable items whose value exceeds that of its gold content. The coin itself weighs 7.98g and has a gold content of 0.2354g. It also has a purity of 22 carats, making it one of the cleanest gold coins in circulation from historic governmental mints. Coins that are produced by trusted government mints are among the safest investments of all coins, and as such are highly popular with investors and collectors alike. As previously mentioned, however, widely used currency, as is the case with the Edward VII Sovereign, can vary in condition. Goldinvestments.co.uk are one of the oldest and most highly trusted vendors in the UK and we only sell the highest quality products, clearly described and verified by the relevant authorities.